Version 3.2 of InsFocus data model is based on feedback from our existing client base and merges it into the InsFocus model. The data model now contains more than 400 insurance information items, to support insurance analytic needs. Insured risks – InsFocus has always supported the specific insured risk model, in which information is detailed for every single risk. Now InsFocus also supports the multiple risk model, in which one policy represents multiple insureds or risks, without specific information for each one. A new set of insurance information items has been introduced for insured risks, including count of insured risks, average premium per insured risk, insured risk loss frequency and claim cost per insured risk. Accident/Prorata = UW – Usually when a new tariff or rate schedule is devised it applies to all new policies written and renewed on or after a specified date. The InsFocus system can now separate business written or renewed by tariff schedules for analysis purposes. We did this by creating a new time base called Accident/Prorata=UW. Accident/Prorata=UW calculates data in Accident/Prorata calculations, while also filtering for the same underwriting period. Policy records – Most policy admin systems support separation of quotes and policies. InsFocus’ new data model now supports policy statuses (quote/policy) and adds an offer date. 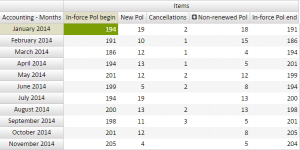 Using those fields, a separate policy records fact table is created. A new set of insurance information items is available, including count of policy records, policy records pending, average days pending, average days offer to accept and conversion ratio. Policy movement report – A policy movement report reconciles the change in in-force business from one period to the next. To enable this scenario, the data model now contains the insurance information items “Expired policies” and “Non-renewed policies”, in addition to the other items that were already there. Adjusted premium in Underwriting time base – A new insurance function named “Adjusted premium” has been introduced which does a pro-rata calculation in the Underwriting time base to account for situations where a risk factor in a policy is changed and a pro-rated premium is added to the policy. Cumulative premium in Snapshot time base – in addition to displaying annual premium, there is now an item for displaying in snapshot the cumulative premium since policy begin. Open claims ageing – an item named “days from claim open” has been added to model to support monitoring claims handling activity of the company. Claim sum insured – in many cases, such as in a list of claims, we want to display the sum insured at the time of loss. For this, we pick the policy’s sum insured at the time of event and create a new item named “Claim SI”. Num OS change – this is an operational information item that measures the number of outstanding estimates changes in a period, which is one of the indicators of claim department workload. Counted policies by section – there are cases in which there is a need to analyze the number of policies sold having a coverage section. Since policies may contain more than one section we added two distinct count items of “…pol by sec” suffix. Separate pro-rata + snapshot monetary items – in the previous model, snapshot and accident/pro-rata insurance information items had the same names as accounting & underwriting items, which has now been separated to prefix “exposed” for accident/pro-rata items and prefix “snapshot” for snapshot items. Maximum estimate item – to find all claims that were estimated above a given value at a point of time (for example above $ 1,000,000), a new item named “Claim max incurred” has been added and can be used in item filter to create lists. Dimension re–grouping – dimensions have been re-grouped into five base categories for easier finding of information, including Client, Product-line, Policy, Claim and Other. Number of products – an item has been added for counting the number of active products in a period for analyzing portfolio mix. To read more about InsFocus Data Warehouse Model 3.2, see the attached document.